Wizenheimer is a Koopa Wizard with a booming voice who acts as the main antagonist of the Super Mario World episode "Ghosts 'R' Us". His name is a portmanteau of the words "wizard" and "wisenheimer," which is slang for someone who makes clever remarks to display their own knowledge, typically in an arrogant manner. Mario, Luigi, Princess Toadstool, and Yoshi first encounter Wizenheimer while searching the Enchanted Forest for Oogtar the Caveboy, who is missing. After Luigi bumps into him in the forest, the Koopa Wizard takes Mario, Luigi, and Toadstool prisoner and forces them into a nearby Warp Tube, threatening to blow the trio up with a Bob-omb if they don't obey. The Warp Tube leads to Wizenheimer's Haunted House, where he shackles his prisoners in the basement. Wizenheimer later captures Oogtar by simply warping him into the dungeon after the caveboy arrives at his door and demands the princess and Mario brothers. Wizenheimer is later found in the basement when Yoshi ventures through the house to save everyone. The Koopa Wizard tries to attack Yoshi, but Yoshi, under suggestion from Oogtar, eats his wand, spitting out a magic blast that frees his prisoners. Mario then jumps on Wizenheimer's head, sending him falling down the staircase. 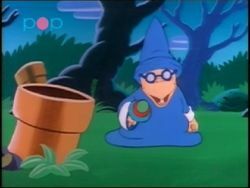 A running gag in the episode involves Wizenheimer's name continuously being mispronounced by the other characters. Such names include: Wisenheimer, Wiseacre, Wizenmeanie, Wisecracker, Wizen-wise guy, Wisen-whatever, and Wisen-whatchamacallit. Uițănhaimăr1 Adaptations of the original name. 1 - Wizenheimer's pronunciation of his name is inconsistent throughout the dubbed version of the episode. This page was last edited on April 18, 2019, at 14:59.